Volkswagen, in the midst of a sales surge, earned its best ranking on Ward&#8217;s FEI of 24.5 mpg. Light vehicles sold in the U.S. achieved an average fuel economy of 22.2 mpg (10.6 L/100 km) on relatively light January sales volume. The result marked the industry’s highest-ever rating on the Ward’s Fuel Economy Index, excluding those months influenced by the government-sponsored “Cash for Clunkers” trade-in program. January’s index rating was up 2.2% over like-2009’s 21.9 mpg (10.8 L/100 km) and up 1.4% from December’s 21.9 mpg (10.7 L/100 km). With the typical December-to-January falloff in daily deliveries, an end-of-the-month recall-related sales halt on Toyota and Lexus models and just 24 selling days, January’s LV sales total of 695,707 was the third-smallest volume covered by the Ward’s FEI. 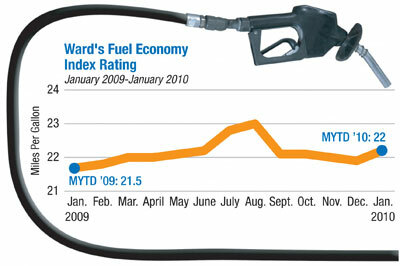 January’s rating raises to 22 the ’10 fleet’s rating, up 2.5% from the ’09 fleet’s performance. Toyota Motor Corp. held the top position in Ward’s FEI with a 25.7 ranking, up 0.6 points from December, largely because some of its biggest trucks were among the vehicles affected by the recall sales halt. Hyundai Motor Co. Ltd. jumped two positions on the index to No.2, gaining 0.6 points from December for a 24.6 rating. Volkswagen AG, in the midst of a sales surge, finished third with its best-ever Ward’s FEI rating of 24.5. Nissan Motor Co. Ltd. was the most improved auto maker on the index, increasing its rating 2.8% to 23.8. General Motors Co. was the second-biggest gainer on a percentage basis last month, as the index’s leading Detroit-based auto makers scored a 20.5 rating, up 2.4% from December. Ford Motor Co. finished with a 20.0 rating, while Chrysler Group LLC saw its rating fall 1% to 18.8. Most auto makers were rewarded in the index as newer models, which generally achieve better fuel economy, have begun to dominate the sales mix. However, BMW AG saw its rating on the Ward’s FEI fall to 20.6 – its lowest since December 2007. Tata Motors Ltd. dragged down by Land Rover’s 11.9 rating, finished the month with the single-lowest company rating in the index’s history – just 13.4. Overall, import vehicles led domestically-built vehicles by a sizable margin, 24.5 to 21.5. January’s third-best finish behind July and August 2009, which benefited from Clunker incentive, was due to improved performances by domestic cars and light trucks. These segments achieved ratings of 24.5 and 18.7, respectively.